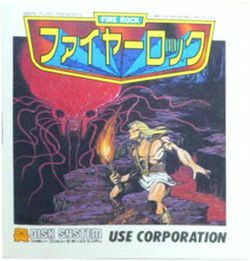 Fire Rock (ファイヤーロック, Fire Rock?) is an action game developed for the Famicom Disk System by System Sacom, and published in Japan by Use in 1988. The design of the game is credited to Mark Flint. In the game, the player controls what appears to be a cave man, whose goal is to navigate a series of item filled caverns in an effort to locate the boss of the level, defeat it, and then locate the door which leads to the next level. The game is commonly sited as having very poor controls, often requiring the player to grab hold of a wall, and very slowly climb it by holding up and tapping jump repeatedly. Other issues include a very low jump that places more platforms and items out of reach, and a difficult time bringing the character back under control if he starts to slip. This game was not released outside of Japan. This page was last edited on 4 July 2013, at 03:17.